Bridal shoes can make or break a wedding day for a bride. Not only does the right shoe have to match the bride, the day, and the dress, but it must be comfortable enough to wear throughout the ceremony, photo session, and reception formalities. However, learning how to select shoes to wear with your wedding dress is not difficult when you follow the right steps. Decide on the fabric of your shoe. Raw silk, crepe, or satin shoes are common choices because these are often the fabrics of the dress. However, diverting from the norm and selecting a different fabric from the dress can add a unique touch to the overall ensemble. Select a wedding shoe color to complement the gown. You can opt for the traditional and choose a color that matches your wedding dress. This may mean you having to bring a swatch along with you to ensure that your colors are identical. Oftentimes, brides have to dye their wedding shoes to make sure that colors are accurate. There is also the option of picking a shade that diverts from your dress but matches your accessories, such as silver or gold. Additionally, you may decide that a shoe adorned with embellishments, such as pearls, beads, sequins, and rhinestones, will complement your overall look. 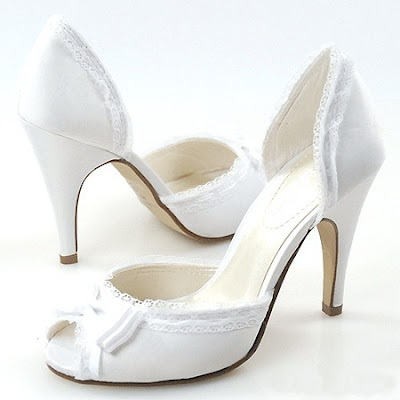 Choose a comfortable bridal dress shoe. Weddings are all day events and you don’t want to kick your shoes off, at least until you have finished the formal dancing. The reality is that comfort is a very significant factor to consider when choosing a shoe, more-so than looks, and you don’t want to find this out while you are cringing during the photo session. Heels should only be an option if you are used to wearing them, and if you are not, but you really want to wear them, then buy them well in advance to break them in and get used to them. Match the style of your shoe to your dress and the occasion. Take into account the formality of the wedding, the style of your dress, and the season when selecting a wedding shoe. For example, a satin, open-toe, off-white slipper would work well with an off the shoulder, open-back, satin gown during the summer. In contrast, a plain raw silk closed shoe would complement a traditional raw silk, full skirted gown during the fall and winter months. Informal weddings allow for casual looks, such as ballet slippers or embellished sandals. Make sure that the wedding shoes you choose will be appropriate for your ceremony and reception venues. Heels don’t work on beaches or stone walkways. Consider your whole wedding day journey before making a final decision on bridal shoes. Opt for wedding gown shoes that make you and your groom look good. If you are taller than your groom, or much shorter, then this should determine whether you get heels or not. Also, heels can slenderize and tone your legs, as well as lengthen your overall physique. So if there are specific looks you are hoping to achieve, allow your shoes to help you accomplish them.